Cathie Filian: SEW EASY: Faux Christmas Stockings Made From a Vintage Bedspread and Place-mats. 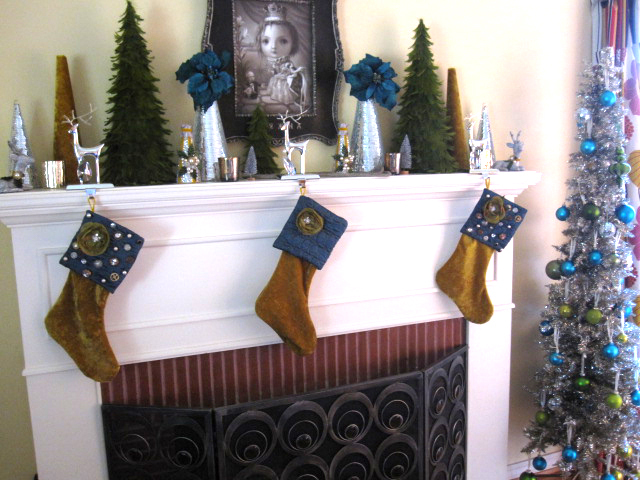 SEW EASY: Faux Christmas Stockings Made From a Vintage Bedspread and Place-mats. Can you believe this was once a bedspread and a place-mat? Faux Stockings? Yes faux! I decided to make these sox as decorations. No need to line them - just a super quick and easy decorating idea. We each have our own personal stockings that Santa fills and those sox are tucked under the big tree and opened on Christmas morning. These stockings are just for looks! This is our third Christmas in our new house and this year I decided to up-size and down-size at the same time. Sounds funny! I gotta get my holiday decorating under control - so I am planning on boxing the ornaments and accouterments by room or tree. I am setting a look for each space and I am gonna try to stick to it for a few years. I am positive that this will make holiday decorating easier and faster next year....(haha) I currently have 5 trees decorated and a gazillion little mini trees. I decided that for the front living-room, I wanted an off-beat color palette. So I went with gold, deep teal, olive green and silver. I had lots of items in this color family and needed to make some new. I am making faux stockings (quick and easy) for decorations, a small tree skirt, cone trees and a few toss pillows. For the fabric I am using a vintage gold bedspread that was given to me by my MIL and teal place-mats from Target (a few years old). I have matching runners for the place-mats so I can use them as decorations too. First I made a stocking pattern. For this I traced a stocking that I made for my hubby 11 years ago. I have no idea if I used a pattern or just free-handed it. Working with the fabric in a double layer and right sides together I pinned the pattern in place. Next, I cut out the stocking pattern. I am making 3 faux sox for across my mantel...so I cut 3 sets. Pin the pieces together along the edge. Stitch the seams. I only allowed for a small seam allowance. Clip the seams every 1/2 inch. This allows for soft curves. Turn the stocking right side out. I had to trim down the place-mat to a small size. I decided to loose a section in the middle and seam up. To do this I trimmed away a few inches. BTW - I like to use matte scotch tape for quick markings. Super simple. Works great on cotton etc. Not good on silks. Trim away the center. I'll saving the scraps to incorporate into the pillows. Open the place-mat with the seaming running vertical in the center and position the top of the sock in the far left corner. Make sure the toe of the sock is pointing to the right. Pin and sew into place. Flip the place-mat in half. Pull the fabric so it has an inch over hang. See the edge in the picture. Fold the place-mat in half. Hand sew the side seam closed. Love this gold ribbon. Leftovers from Creative Juice. Hand sew a loop hanger to the corner. A silk flower with a rhinestone button to the left corner. BTW the silk flower is from my shop..... Silk Flower Section at Cathie Filian Supply Shop. Hand sew buttons to the top of the stocking. Hang across the mantel. You can see from the picture that I still need to sew the buttons to the center stocking. Time to get stitching! You are so awesome Cathie! Must run in the name lol! 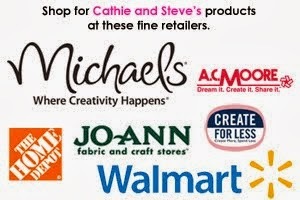 (I'm a Cathy) Will you please guest post this over at Cap Creations blog? Great idea! I was looking at my mantle earlier thinking it needed stockings but our stocking match our personalities and not our decor so making stockings as decor is a great solution. THanks for the idea!